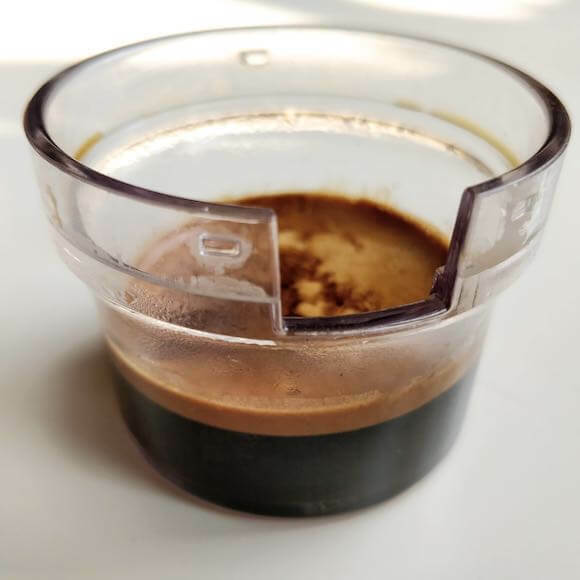 Cafflano Kompresso Review: Can It Make Real Espresso? The Cafflano Kompresso is a small coffee maker with a big impact. It makes quality espresso shots available to a whole new subset of coffee lovers. 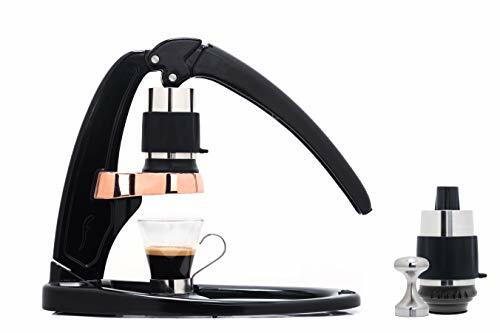 If you want to drink an occasional espresso at home or on the go without investing in expensive gear, you now have a viable alternative. Back in the days, espresso was an elitist hobby, requiring an expensive machine with an Italian sounding name and a similar grinder. That has all changed in recent years with the introduction of manual espresso makers such as the ROK, as well as quality hand grinders. Now the barrier to entry just got lowered further with the introduction of the Cafflano Kompresso. This diminutive coffee maker could be mistaken for a cheap Aeropress knock-off but in fact, it is an extremely capable manual espresso maker. Cafflano is one of the new and interesting names on the international coffee scene. The company launched their first product, the Cafflano Klassic in 2013 after a successful Kickstarter campaign The Klassic is a small and portable all-in-one coffee maker with both grinder, dripper and gooseneck kettle built in. The company was started by Hansang Yoon, a South Korean coffee lover, who didn’t like the idea of buying expensive takeaway coffee all the time. So he scratched his own itch and developed the brewer. The second product launched by Cafflano was the ‘Kompact’, which is also an ultra-compact black coffee brewer. The newest product in the line-up is the Kompresso; the company’s first stab at the espresso scene. A few years ago espresso was something for people with big wallets and serious patience. Espresso was and is a hobby that requires time and money. Everybody can afford a Hario V60 but only people who mean serious business are gonna take the step and invest in a device from Rocket or La Marzocco. In recent years we have seen some great, cheap options for the espresso lover on a budget. The Rok and the Flair espresso makers come to mind. These machines represent great value at less than 200 dollars. The Cafflano Kompresso is even cheaper. And as an added bonus it’s as portable as an Aeropress. Can you expect espresso miracles from these new and cheap devices? Will it be able to deliver a god-shot? Well, you will certainly be able to produce extremely delicious espresso. And by that, I mean shots that are far superior to what you are served in mediocre coffee shops. 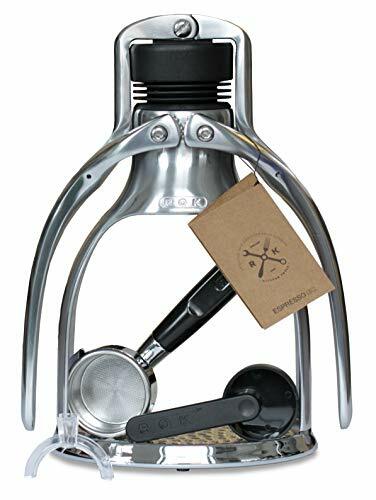 The manual espresso makers are all capable of delivering enough bars to pull true espresso shots. However, if you really want to achieve espresso perfection there is a steep learning curve. It’s also worth remembering that each shot takes some effort to produce – especially if you combine the manual espresso maker with a manual grinder. 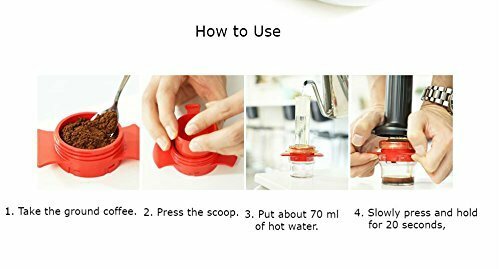 The Cafflano Kompresso is a lightweight device, mostly consisting of BPA-free plastic. The naked (pseudo) portafilter and shower screen are made out of etched metal, though. In many ways, you could compare the construction to the Aeropress. There are a chamber and a piston that work together and use hydraulic pressure to force the water through the coffee puck. The device doesn’t feel heavy duty and at first, I was a bit afraid to exert full pressure using it. It turns out that it can easily handle both normal use and more extreme scenarios where almost all my body weight is placed on the device. This has been the case a few times where I have used too fine a grind. The only thing I can be a little bit worried about is the rubber ring sitting on the shower screen. A little bit of misalignment and I fear that an accident could happen. 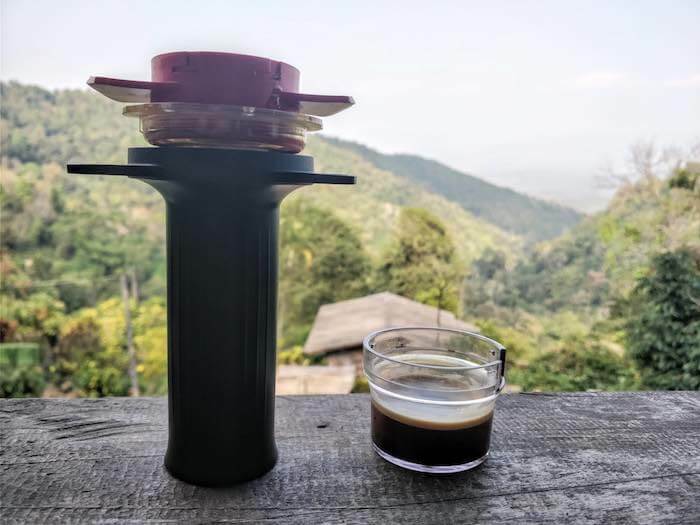 Hopefully, (like with the Aeropress) it’s easy and cheap to get a replacement, but I haven’t been able to find anybody requiring extended customer service so far. If you’re familiar with dosing, tamping and brewing espresso it should be pretty easy to start using the Cafflano Kompresso. Obviously, there is no portafilter here. Instead, there is a small basket filter, that can take around 12-15 grams of coffee. I have found that the funnel that comes with the Aeropress works great for adding coffee. The scoop that comes with the device also doubles as a tamper and it would work a little better had the company’s logo not been protruding ever so slightly. Still, it’s usable. 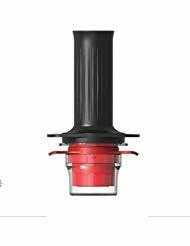 Once you have dialed in your grind it’s pretty easy to insert the piston and press it to the bottom. It’s possible to exert a lot of force and I’d say that the famous 9 bars are within reach. If you go too fine, however, you’ll really have to struggle getting any water to pass through the coffee. The opposite is also true. A perfect grind is really essential with this contraption. A quick sidenote: I was able to get pretty good results even with cheap grinders such as the Hario Skerton Pro. Grinding a single shot does take a long time but it’s worth it. As mentioned earlier the espresso tastes rich and smooth. Just like a good espresso should taste. I have seen other bloggers comment that it’s impossible to get crema out of the device but that’s simply not the case. When you dial in the grind you will achieve it. How much? Well, it’s certainly not gonna be at the same level as some commercial machines but if you use a pretty fresh medium-dark roast, you should be able to get half an inch. It’s very easy to clean the Kompresso and control all variables meaning that you won’t encounter any stale shots if you live up to your duties as a home barista. As if all this wasn’t already pretty cool. The Kompresso has one more ace in its sleeve: It’s capable of making cold-brewed espresso. I first saw this on Cafflano’s own Instagram account and was mildly skeptic. I still tried it, and honestly, I was pretty blown away. The recipe is almost like a normal espresso shot. Except you tamp extra hard and allow a 1-minute pre-infusion. Well, and of course you use cold water instead of the usual 200 F.
Cold brewed coffee can taste pretty flat and dull and especially lacking acidity. But cold-brewed espresso on the other hand… this is a game changer. Supremely smooth and complex at the same time. Almost no bitterness, but plenty of acidity. This is especially true with quite light roasts that normally wouldn’t be suitable for espresso. Honestly, I probably make more cold-brewed espresso than hot these days. This brewer has many things going for it but speed and efficiency aren’t part of them. Especially not when paired with a hand grinder. It can easily take 5-8 minutes to make a single shot, which is pretty damn slow. Also, it does take some time to dial in your grinder. Making shots that clogs the filter or just pass right through is a frustrating experience. Aside from that, it’s hard to come up with any real negative arguments against this tiny espresso maker. Because we’re in a rather new product category – the manual espresso maker – there are only few alternatives to the Cafflano Kompresso. And you could even argue that they aren’t real alternatives. The Rok Espresso Maker is the first manual espresso maker to really make a name for itself. It features a striking design – a bit like an oversized nut-cracker. It can make good espresso, though. The downside is that it’s not really portable. The Flair Espresso Maker also makes good espresso. It is also more of an alternative to the Kompresso. It’s quite lightweight so theoretically, you could put it in its box and bring it over to a friend’s house. Still, even though it’s not really heavy it does feel like carrying a small suitcase, so in the long run, it’s not really that cool. The Cafflano Kompresso is the cheapest espresso maker that I know of (that isn’t completely worthless). The design is intelligent and simple and it seems built to last. Being so small and lightweight it’s also by far the most portable espresso brewer around. I could see the typical pour over people dip their toes in espresso with this one. Espresso lovers looking for a device to bring along on a trip or picnic could be an ideal audience as well. The Cafflano does need to be paired with a grinder that can go pretty fine, though. 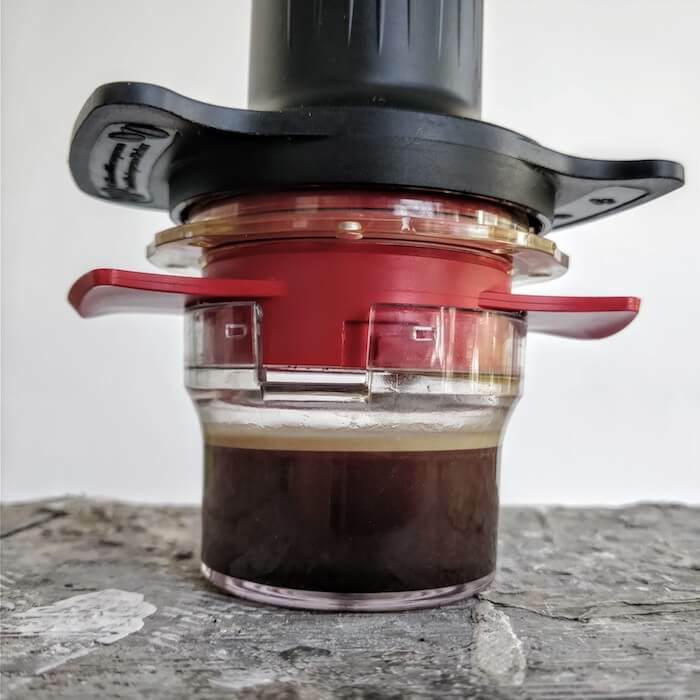 Casual coffee drinkers might be better off with a capsule system as this device does require some tinkering and tweaking to get stellar results.